Sergey “Krusher” Kovalev regained his WBO Light Heavyweight World Title in classic Krusher fashion with a second round stoppage of Vyacheslav Shabranskyy at the Theater at Madison Square Garden and live on HBO World Championship Boxing. Kovalev came out of the gates swinging, knocking down Shabranskyy twice in the first round. The second round continued with more hard shots from The Krusher and a third knockdown. Finally, at 2:36 of the second round, the referee called a halt to the action and Kovalev was named the new WBO champ. The punch stats clearly favor Kovalev, who connected for 50 of 113 punch attempts (44%) compared to 16 of 71 for Shabranskyy (23%). The Krusher also landed 62% of his power punches (36 of 58), compared to 30% (8 of 27) for Shabranskyy. Finally, for jabs Sergey landed 25% (14 of 55) and Shabranskyy landed 18% (8 of 44). The co-feature of the evening started off with a bang as both Sullivan Barrera (21-1, 14 KOs) of Guantanamo Bay, Cuba and Felix Valera (162, 13 KOs) of Santo Domingo, Dominican Republic scored knockdowns in the first round. 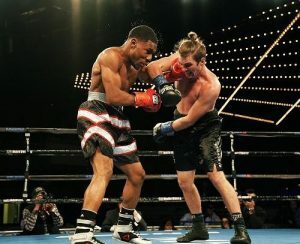 In the second round, Valera began to taunt Sullivan with his antics but Barrera countered with hard shots that put a quick end to the showboating. However, Barrera suffered a cut over his left eye that started to swell in the second round. Shortly after the bell rang to start the third round, Valera hit Barrera with a low blow that cost him a point on the judges’ scorecards. Both fighters continued to trade hard shots over the next few rounds. 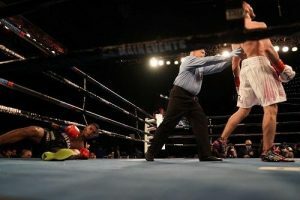 In the sixth, the action continued to intensify and referee Mike Ortega deducted another point from Valera for hitting Sullivan with the second low-blow of the night. 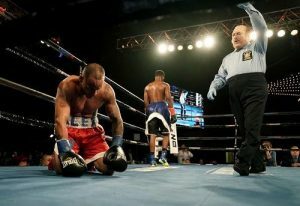 The low blows continued in the eighth and the referee took another point away from Valera. However, at the start of the ninth round, it was Barrera who lost a point for a low blow. This exciting grudge match continued into the tenth and final round with both competitors trading big shots. At the end of ten exciting rounds, the judges all scored the bout in favor of Barrera (98-88, 97-90 and 97-89). 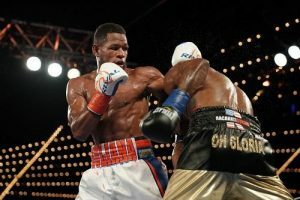 The live HBO telecast began with a controversial decision between Yuriorkis Gamboa (28-2, 17 KOs) of Miami, Florida and Jason Sosa (20-3-4, 15 KOs) of Camden, New Jersey. Despite a deducted point for holding in the tenth, Gamboa was declared the winner by majority decision after ten hard-fought rounds. The scorecards varied widely for this bout. One referee scored the contest 94-94. The other two judges scored the fight for Gamboa 95-93 and 96-92. Grozny, Russia native Bakhram Murtazaliev (11-0, 9 KOs) kept his stoppage streak alive with his seventh straight knockout over Carlos Galvan (16-6-1, 15 KOs) of Antioquia, Colombia at 1:31 of round five. 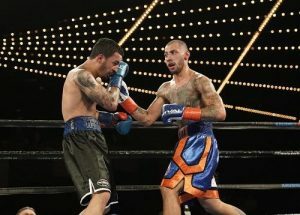 After a 14-month layoff Brooklyn’s own Frank “Notorious” Galarza (18-2-2, 11 KOs) made his triumphant return to the ring with a lopsided unanimous decision victory over Jaime Herrera (15-5-1, 8 KOs) of Chicago, Illinois. Herrera suffered a cut over his left eye in the fifth round but managed to finish the fight. The judges scored the fight 78-74, 80-72 and 79-73 all in favor of the hometown hero. 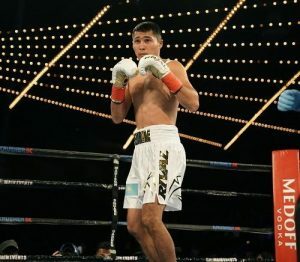 Middleweight prospect Meiirim “The Sultan” Nursultanov (5-0, 4 KOs) of Astana, Kazakhstan needed less than two rounds to stop the previously undefeated Eric Moon (7-1, 6 KOs) of Atlanta, Georgia. The referee stopped the contest at 1:54 of the second round. New York native “Lightning” LeShawn Rodriguez (8-0, 7 KOs) stopped Alex Duarte (7-3, 5 KOs) of Sao Paulo, Brazil at 1:48 of the third round. Rodriguez recently returned to the ring last month after an 11-month injury layoff. His performance against Duarte tonight proves the 24-year is back! 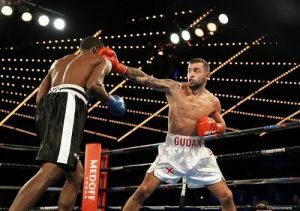 Former kickboxer Enriko Gogokhia (7-0, 3 KOs) of Zugdidi, Georgia improved his undefeated record with a unanimous decision victory over Jose Abreu (13-3, 8 KOs) of the Dominican Republic. Two judges had the score 59-54 and the third judge scored the bout 60-53, all in favor of Gogokhia. In the first bout of the evening Bronx native Ismael Villarreal (1-0) made his professional debut with an impressive shutout unanimous decision over Race Sawyer (0-5) of Salt Lake City, Utah. One judge scored the bout 40-35 while the other two scored the contest 40-36 in favor of Villarreal. A Disappointing Year For Kell Brook – Will He Deliver In 2018?